Starting Jan. 1, motorcyclists in California under age 21 must attend a 15-hour motorcycle skills and safety course first before they can get a learner’s permit to ride a motorcycle ride on the street. This new law is a result of a tragic incident that occurred three years ago at a suburban cul-de-sac in Fair Oaks, CA. Teen Jarrad Cole had passed the required DMV written exam for a motorcycle learner’s permit. He and his dad, Evan Cole , bought a Suzuki RS . His dad, purportedly an experienced rider, drove it home and then set up practice cones on the street to teach his son how to ride. Jarrad was wearing protective gear, including a helmet and gloves, when his dad stepped into the garage to get more cones. Cole heard the bike’s engine rev, then heard the motorcycle crash. Cole is unclear as to precisely what happened. What he knows is that his son severed an artery in his chest, and died shortly thereafter. Soon after, Jarrad’s younger brother launched campaign to change state law. With the help of then-Assemblyman Roger Niello and lobbyist Michael Hawkins, the campaign was a success. AB 1952 was passed this year, and as of January 1, 2011, California Vehicle Code will be amended to include a new statute, VC 12509.5. The new law will require motorcyclists under the age of 21 to take a 15-hour Motorcycle Safety Course prior to receiving a learner’s permit. Once the teen has passed the course, he or she qualifies for a learner’s permit. The permit will allow the teen to ride on streets, but not at night, not on freeways and not with passengers. After six months, he or she may then qualify for a motorcycle license. A couple of years ago, ABATE of California was approached by the uncle of the teenager who died, asking for the group’s support in getting the law passed. ABATE voted not to support the legislation. Although we are proud members and staunch supporters of ABATE, once in awhile we break ranks from their position. This is one of those times. 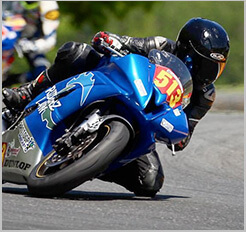 As motorcycle accident lawyers, we see far too many motorcycle accidents that could be avoided by proper training. This is all the more tragic when the riders are young. We’ve read the pending legislation, and applaud the new requirement for young riders to receive proper training. In fact, we strongly encourage motorcyclists of any age to take a motorcycle safety course. Sign up or get more information here. It could save your life.